Morning everyone. Oh...I feel like things are starting to get back in order now. We had a rough week...Still lots to finish, but at least there is some direction with it all. 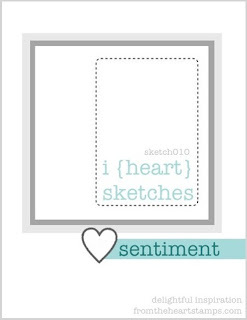 Today is the start of a new sketch challenge over at From The Heart. It's pretty straight forward and simple too. 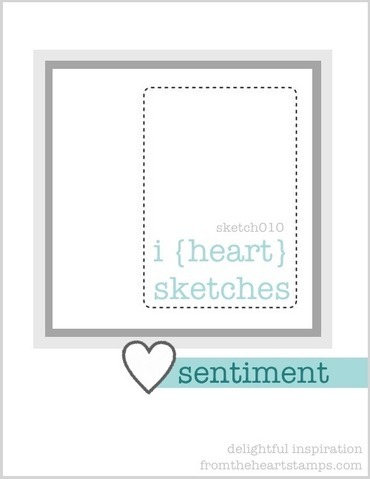 I used Hello Bunny, which is a new image to the store and the sentiment is from the Hello Sentiment Pack. I colored my image with Copic and the patterned paper is from Fancy Pants Designs: Park Bench. So I hope that you will play along with us this week. You don't to use a FTH image, but if you need one or want one, there a great deal to choose from. Oh my! this is just too darn cute and sweet! Such a precious image - with beautiful coloring! Thanks for joining us at My Time To Craft! Calypso, this is adorable! Love the image. What a gorgeous card - so cute! Thanks for joining us at DICC this week!